37 years ago today, on Monday, January 7, 1974, the game show “Jackpot!” with host Geoff Edwards, premiered on NBC’s daytime lineup at 12noon (11am Central Time). Unused ticket for “Jackpot!” from September 28, 1974. Contestants stood on risers and would read riddles to another contestant who was the ‘king of the hill.” The “king” (or “queen”) would select a contestant and that person would reveal the value of their riddle before reading it. If the riddle was answered correctly, the dollar amount would be added to the show’s jackpot (get it?). One contestant was holding the JACKPOT riddle and that’s how you won the prize money. If you got that one right, the two contestants would split the jackpot. 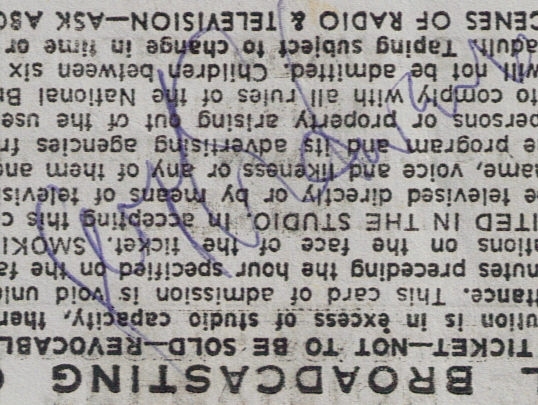 Geoff Edwards autograph signed on September 28, 1974. When the show failed to win a big audience, they replaced the riddles with regular questions. But that wasn’t enough, and “Jackpot!” was cancelled in September 1975, after less than two years.